Put a creative touch on your Fourth of July celebration this year with a DIY project perfect for backyard BBQs and gatherings of all kinds. From garlands and centerpieces to bingo cards and trivia questions to popcorn cones and ice cream cup wrappers, there's a project for every patriotic party. For a spectacular finish to your meal, surprise your guests with a grand dessert topped with "fireworks." Set the table for your Independence Day BBQ with an American flag table runner. These DIY star straws are such a cute idea and are an easy way to dress up your drinks and cocktails. Nothing says summer like pineapple! These painted pineapples with sparklers make for such a fun centerpiece for your Fourth of July bash. Enjoy the evening's display of fireworks with sparklers in hand. These will surely be a hit with the kiddos! This banner is super easy to assemble and makes for a quick way to decorate your deck or patio. Your holiday outfit just isn't complete without a pair of these spectacular firework glasses! Serve up a refreshing scoop of ice cream in these stylish DIY ice cream cups. String up these paper lanterns adorned with stars for dreamy party decor. Keep kids and adults alike entertained with a Fourth of July themed bingo game. This red, white and blue wreath fashioned from paper pinwheels is a fun way to decorate your front door. Fill these DIY boxes with red, white and blue candies, and hand them out to all your guests as party favors. Print and frame this fantastic artwork for the holiday season and reuse it every year. Stir up some dinner conversation with these utensil holders! Each holder features a trivia question related to the patriotic holiday. Add some boom to your table with a DIY fireworks table runner. This cute bandana can be worn with any Fourth of July outfit. The design is subtle enough that you could get away with wearing it all summer long–it makes for a great way to keep your hair out of your face at the beach. This fun garland resembles Fourth of July fireworks. It's assembled out of tissue paper and you can craft it in a single evening over a movie with friends or family. Add some patriotic decor to your mantel with this traditional stars and stripes artwork crafted with wood and paint. Set up a snack station for guests with these adorable popcorn cones! Mix it up and fill some with caramel corn or kettle corn. Every party needs some balloons. These pretty confetti balloons are our ideal choice for this year's gathering. Make a few of these paper stars and hang them on a wall or from a tree for some inexpensive decor. Surprise your kids this Independence Day with rocket fireworks pencil toppers. You can set up an arts & crafts table for kiddos at the party and top off all the crayons and markers with these. 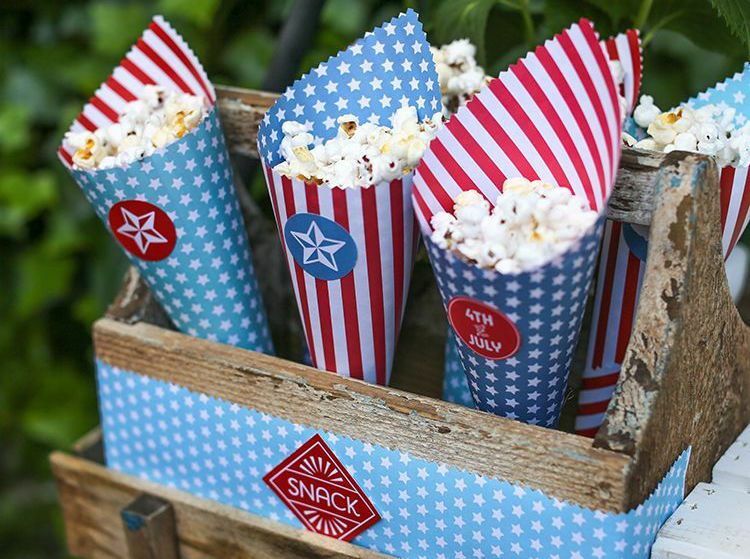 Serve snacks, such as popcorn or chips, in DIY patriotic bushel baskets. Paint them in red and white and line the basket with a blue bandana to complete the look. Let your little princess show off her American pride this Independence Day by making her this super cute tee. Have a picnic this July Fourth on your own homemade red, white and blue stars picnic blanket. This simple craft is a fun way for children to celebrate July Fourth. They can design their own wand using basic craft supplies and then play with it all day! Make your own custom baseball cap using tie-dye. Your completed patriotic hat is perfect for a day in the sun this July Fourth. Keep the kids entertained on July Fourth by printing out these windsocks that they can color in with crayons and markers. You can then assemble them into windsocks with ribbons and hang them from a tree. For adults who would rather not color the windsocks, there is also a color template available to print. Cupcakes are always a hit at any celebration. Finish yours off with these DIY cupcake toppers for a sweet surprise. Don't forget about the garden! Decorate yours with a set of DIY paint stick flags.